The 100 ton deluxe edwards ironworker has it all. The 100 Ton Deluxe Ironworker is loaded with 5 workstations and 100 Ton of hydraulic power. Punching up to a 1-1/16 hole in 1 inch steel. 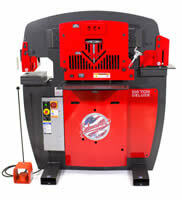 This ironworker also includes an angle shear, flat bar shear, rod shear and a coper notcher. 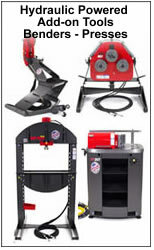 With the ** Powerlink System, it will also power Edwards hydraulic accessories like the 10 ton pipe & tube bender, shop press and press brake, making it the center of a fab shop. This is one powerful ironworker. I’ll answer your questions and make an honest recommendation for the right ironworker. Rod Shear 1-1/2 Round 1-1/4 Sq. 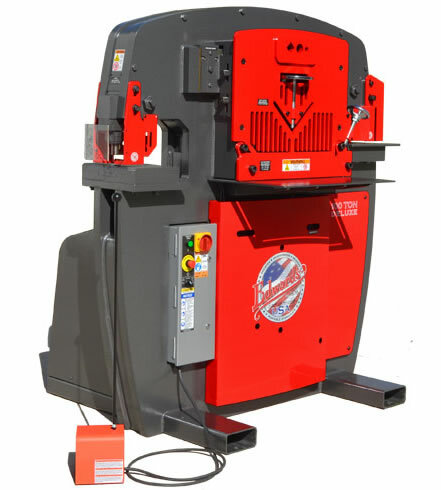 The 100 ton deluxe edwards ironworker punch can put a 1-1/16 hole through 1 inch steel plate! 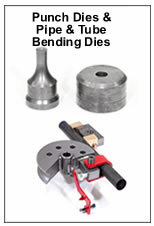 Pedestal Die Table Punch – is standard for flange or web surfaces of 2″ x 2″ steel angle, channel, beam. Flat Bar Shear On this ironworker work for up to 18″ wide x 1/2″ thick” steel. 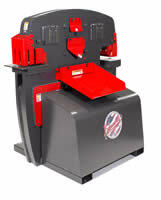 Angle Shear cuts both thin and thick steel angle up to a 6 x 6.